Wow, just found your pirates of chamon. They look awesome! 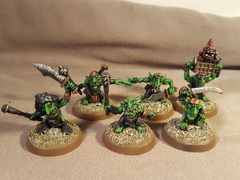 Was it the gitmob grot kit used as the basis for these? So I know these aren't technically elves but the Wood Elves from the land that was hung around with walking trees so why should it be any different in the mortal realms! Sorry, what's that... wanderers betrayal in Ghyran?.... surely that's water under the bridge now! Anywho, here's my 3 kurnoth hunters, minus one head. We'll just say he's the unit champion for now until I source a replacement. For those that are wandering where the head has gone I've used it for my Avatar of the Hunt conversion which is currently in progress. For those that are interested I undercoated Abaddon black, basecoated the bark areas in Calthan Brown (old foundation paint) and the green "flesh" areas Orkhide shade (another old paint). Bark was then layered dessert yellow and finally ushabti bone before a wash of Aggrax Earthshade. Green areas were layered with Warpstone glow and moot green before a wash of Athonian camoshade. Fanatics moving like endless spells (i.e potentially controlled by both players depending on who chose the first move in the battle round) is actually a pretty cool, thematic idea. This could be coupled with a rules change so that they inflict damage like some endless spells just by moving through units. That to me would balance them out and not require any extreme points increase. Plus makes them the potential threat to friend and foe they're supposed to be! There's also the fact that whoever goes second in a turn gets first move of endless spells on the battlefield. Endless spells have made taking the double not quite the no brainer it once was. It's not game breaking but considering that they give your opponent another decision to make is good in my opinion, seeing as it can potentially lead to them making the wrong choice. Sorry, i shouldve been clearer, the Archmage on dragon can cast two spells without the balewind, it's baked into the warscroll although you need to take the arcane tome option rather than the sword. Basic Archmage on foot (or indeed any wizard with the right number of wounds) can cast balewind to then be able to cast two spells (well 2 spells in each turn after the balewind is cast). Archmage on dragon with book of hoeth can cast two spells a turn. Otherwise just take a balewind vortex as that let's any wizard cast two spells whilst on it. The Saurian is a terrifying prospect no doubt but the minute you focus fire power into it with any rend it loses effectiveness. If you came up against an artillery or shooting heavy army I think you'd be in trouble. Got to say I agree with this. Where does it say compendium models aren't legal? As long as they have a points value and a matched play profile theres no issue using them. Im a wood elf player and still make use of the rules for Wardancers, Waywatchers, Hunting Hounds and even the Avatar. My understanding is that when they get the "legends" treatment is when they don't become legal for matched play anymore. I use Swifthawk Agent Reavers as my generic battleline. Min unit size of 5 that costs less than glade riders (granted 3 less models though), can shoot 3 times, then also run after shooting. Plus you can use the old glade rider models to represent them.